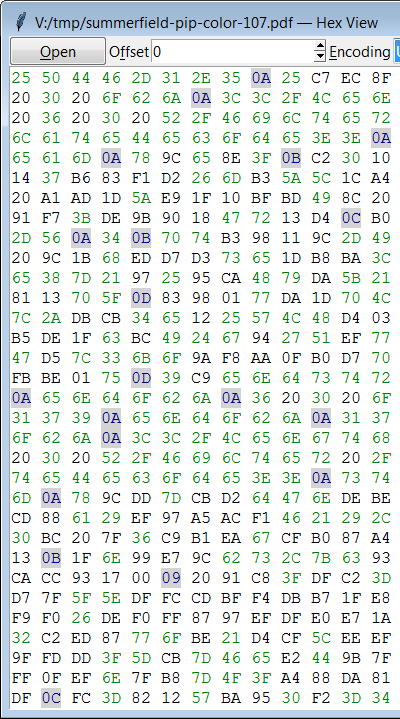 It is sometimes useful to see the raw bytes in a file, and for files that contain text, to see what those bytes look like as characters in various different encodings. In this article we'll review a complete Python GUI program—short enough to type in—that provides this facility, and shows how easy it is to create small graphical tools using Python's built-in tkinter library. Here's the application shown running on Windows—it also runs on Linux and should work on any Unix/BSD system. All the code should be put in a single plain text file called, say, hexview.pyw. The file could be created by the IDLE editor (which comes with Python—just, start it and then click File→New File, and type in the code), or any other modern Python-savvy code editor or IDE (e.g., the good and free Notepad++ on Windows). We'll review the application's code in order from beginning to end, and so we will start with the imports. Most GUI libraries have so many components that people often use star imports, for example: from tkinter.tk import *; from tkinter.ttk import *. However, I prefer to simply use shorter names (tk, ttk, and filedialog) so that I can see what comes from where. Incidentally, the first line is just a comment—but one that is used to determine which Python to use, so while not strictly necessary, I recommend always starting with it, even on Windows. These are the constants we'll need. The application will show 512 bytes at a time from a given byte offset using two digit hex numbers (00-FF) for each byte. It will also show those bytes as text using a user-specified encoding. Python supports lots of different text encodings: here we've just put in some common ones; you can easily add as many more as you like. The application's functionality is encapsulated in its MainWindow class, which we'll review method by method. When a MainWindow is created we store the parent that's passed in and then use separate methods to set up various aspects of the user interface. At the end we check to see if a filename was given on the command line (sys.argv contains the name of the program, sys.argv and so on—if present—contain the command line arguments), and if an argument is given, we assume it is a filename and attempt to open it using the private MainWindow._open() method shown later. Note that the __init__() method—and all the methods that follow it (those whose first argument is self)—should be indented under the MainWindow class declaration. We keep track of the name of the file we're showing using a normal string. But for the offset and encoding we create an IntVar and a StringVar. These are special tkinter-specific types that hold a value (an int and a str) which is set using a set() method and retrieved using a get() method. We'll see shortly why we need to use these types. The user interface has an outer frame (the visible window) which contains a couple of buttons (Open and Quit), some labels, and a spinbox and a combobox. Every widget must have a parent (given as the first argument to its constructor). Widgets from the ttk module are styled to look native, unlike those from the tk module, so we prefer ttk widgets where available. There are more ttk widgets than tk ones, with most ttk widgets superceding existing tk ones of the same name, and some entirely new ttk widgets not present in tk. However, there are a few tk widgets that have no ttk equivalents. When a button is clicked, the function or bound method given as its command will be called. If an underline is specified, Tk will underline that character (e.g., the ‘O’ in “Open” and the first ‘f’ in “Offset”). These underlines are used as visual cues telling the user that a press of Alt+underlined_letter will perform an action. In the case of a button, the press should have the same effect as clicking—but we must program the behaviour ourselves, as we will see in the create_bindings() method. The spinbox's textvariable is set to the self.offset (of type tk.IntVar). This means that if we change self.offset programmatically (by calling self.offset.set()), the value set will automatically be reflected in the spinbox—which is why we needed to use a tk.IntVar rather than a plain int. Correspondingly, if the user interactively changes the value in the spinbox, the value they set will be reflected back into the self.offset. In other words, the spinbox and its textvariable (self.offset of type tk.IntVar) are automatically synchronized. The same principle applies to the combobox and the self.encoding (of type tk.StringVar)—except that here a string is used rather than a number. Tk provides a tk.Text widget which can display styled (“rich”) text. It is possible to make a tk.Text widget support styled text editing up to a point, but I've certainly never found a way to turn it into a fully fledged styled text editor (so show me if you have!). Furthermore, tk.Text has no built-in support for reading or writing styled text. Both can be done using say, HTML, but we'd have to write our own code to do it. We can add as many tags as we like to a tk.Text widget, each with a unique name (e.g., “error”), and with any number of configurable properties. Here we just set colors, but it is possible to set font attributes too. The tags themselves do nothing unless applied to inserted text as we'll see further on. Tkinter has various layout managers, but the easiest to use is grid. Here we've put almost all the widgets as a single row along the top and then put the self.viewText (of type tk.Text) below and set it to fill the frame it is contained in (apart from the row of widgets above it). And at the end we tell the containing frame to fill the application's window. Apart from the last loop, this method is used to create keyboard bindings. The first two allow users to press Ctrl+O or Alt+O to click the Open button, and the second two let users press the Quit button by pressing either Ctrl+Q, Alt+Q, or Escape. If the user presses Alt+F we give the keyboard focus to the offset spinbox, and if they press Alt+E we give the focus to the encoding combobox. After the user has clicked Open and chosen a file to view, we show the file's first block using the current encoding. If the user wants to view another block or change the encoding they can use the spinbox and combobox. This works because in this method's last loop we have told Tk that whenever a new value is written to the self.offset (tk.IntVar) or self.encoding (tk.StringVar) using their set() methods, Tk should call the show_block() method. This method (and its helpers, below) is the heart of the application. It begins by deleting all the text in the self.viewText widget (from line 1, column 0 to the end—the widget uses 1-based line numbers and 0-based column numbers). If there's no filename, we're done. Otherwise we open the file in read-only binary mode, seek to the given byte offset, and read up to one block (512 bytes). Once we have the block we need to split it into rows, each one containing BLOCK_WIDTH bytes. This is done in a single statement (rows = ...) where we step through the block from beginning to end in BLOCK_WIDTH steps and creating a list of bytes objects (i.e., read-only byte arrays) of BLOCK_WIDTH bytes using a list comprehension. At the end of the method we iterate over each row and show its bytes followed by the decoded text represented by those bytes in the self.viewText widget, and finish by adding a newline at the end. Is it inefficient opening the file every time we need to show a 512 byte block, and then closing it again? In theory, yes, but in practice it doesn't matter. First, because a modern operating system will read not just 512 bytes but a bigger chunk (4K, 8K, 16K or more), and this will stay in a RAM buffer so most subsequent calls will be to RAM not disk. Second, even if we set an offset that's outside the buffer and require a fresh disk read, by the time the user has finished changing the spinbox's offset (e.g., by pressing and releasing the Up arrow key, or by entering a number), the computer has about 200 milliseconds to respond before the user will notice any delay. This is far more time than is needed to do a disk read (even from a physical spinning disk), and repopulate the self.viewText tk.Text widget. This method iterates over every byte in the row it is given and adds each one to the self.viewText widget. If the byte is whitespace or in the printable 7-bit ASCII range, we add suitable tags for coloring the foreground and/or background. We insert each byte as a two-digit uppercase hexadecimal number with the formatting tags followed by a plain unformatted space. If there are less than BLOCK_WIDTH bytes (e.g., the last row of the file), we pad with spaces allowing three per byte, two for the hex digits, and one for the following space. After writing the bytes in hex, this method is used to write them as text. We decode the bytes into characters using the encoding set by the user, replacing any that can't be decoded by the Unicode U+FFFD replacement character. If the character is a Unicode whitespace or the replacement character we represent it with a full-stop and also set a tag color. If the character is outside the Basic Multilingual Plane (BMP), we represent it with a question mark and set the error tag color. (Python strings can handle all Unicode characters, but unfortunately tkinter widgets are limited to those in the BMP.) Once we have the character to display and its tags, we insert it into the self.viewText widget. And after all the row's characters have been inserted, we insert a newline ready for the next row. When the user clicks the Open button this method is called. It starts by clearing the self.viewText widget and then sets the offset to 0. It then pops up the platform-specific file open dialog and then calls the same private MainWindow._open() method that we saw called in the __init__() method. This method begins by checking to see if the filename it was given is non-empty (and not None) and exists in the file system. If these checks pass, the method next updates the application's title to include the filename. It then computes the maximum offset to allow—a value less than the number of bytes so that if the user runs the spinbox to its maximum, some bytes from the file will still be visible. Then the filename is stored and show_block() is called to show the file's first block. If the user clicks the Quit button (or clicks the window's X close button), this method is called. It tells the parent (the app variable) to destroy itself leading to a clean termination. This is the last MainWindow method. The final few lines are top-level, that is, not indented at all. Tkinter doesn't really have an application object, instead it provides an invisible top-level window which we use as the parent of a real visible window. If the user clicks the application window's X close button the MainWindow's quit() method will be called. Since we always show a fixed block of 512 bytes we've made the window non-resizable. Calling mainloop() starts the GUI event loop and the method doesn't return until the application is terminated. There are many Python GUI libraries available. Tkinter is small, fast, and comes with Python—it is excellent for creating tiny applications like Hex View. But for more substantial applications, especially those requiring sophisticated custom widgets, I recommend using PySide (which is what I use), or PyQt, or wxPython instead.